Shrimp on the "barbie"! We love shrimp cocktail in our house. I make it more than the normal person. In the summer months we grill so much that I am always looking to change things up in anyway I can. I also love grilled shrimp and grilled shrimp cocktail. They are done in 8 minutes! How can you beat that? When they are grilled the shrimp get a nice smoky flavor from the grill and then are brushed with sweet and tangy and slightly spicy cocktail sauce. Serve with lemon wedges and more sauce. Stir together all of the cocktail sauce ingredients in a medium bowl and remove 1/2 cup into a separate bowl. That will be to baste the shrimp with. Refrigerate for at least 2 hours. Soak the wooden bamboo skewers in a dish filled with water at least 45 minutes. Preheat your gas grill to medium heat. In a bowl, toss the shrimp in the canola oil, salt and pepper. Add four shrimp to each skewer. Place the shrimp on the grill grate, close the lid, and grill for 4 minutes. Brush with cocktail sauce. Flip and grill for 4 minutes. Brush topside with sauce again. Each side will be coated. Remove from the grill and serve with remaining cocktail sauce and lemon wedges on the side. Nom! These look awesome! We finally bought a grill just a month or so ago and I need lots of grilling ideas! Thanks Gina! They would be perfect for your grill! This looks great and so delicious! 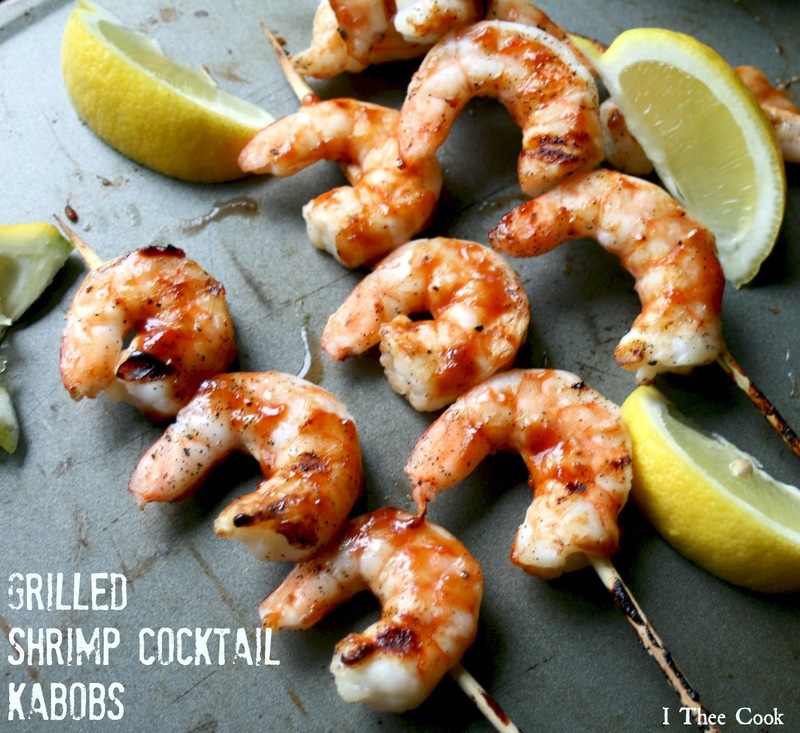 I love finding new ideas for shrimp because I love shrimp...thanks for sharing! YUM! I love shrimp so I have to try this one. I found your recipe over at the Show Me What Ya Got link party. I host Tickle My Tastebuds Tuesday and would love it if you would come over and share this recipe. I’m sure our party goers would love it! Here is the link http://bit.ly/1nY3oYQ. Have a wonderful day! Oh yeeaaaah. This shrimp looks awesome! Love horseradish, I'll for sure have to give this a try! Great recipe, Rina! Looks so good. Thank you so much for linking up at Tasty Tuesday! Your recipe has been pinned to the Tasty Tuesday Pinterest board! Please join us again this week! Congrats!!! Rina! These lovely Grilled Shrimp Kabobs will be featured this week at WONDERFULLY CREATIVE WEDNESDAYS as a Nibbles By Nic Favorite!!! Hope to see you again and make sure to also pop by Munching Mondays with your fantastic nibbles!